The Solar Arc Directions is simple and very useful predictive method. 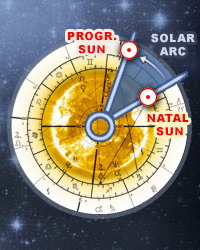 Solar arc is defined as the difference between the position of the natal Sun and progressed Sun on any particular day. This arc is then added to every planet, point and house cusp in the chart.